Have you seen this man in Freehold? Whatever Happened To … Fotomat? Back when everyone used film to take photos, they had to get their photos processed and printed somewhere. For a while, Fotomat was a popular place to do that. The company’s distinctive gold-pyramid-roofed huts were all over, typically as freestanding kiosks in shopping plaza parking lots. 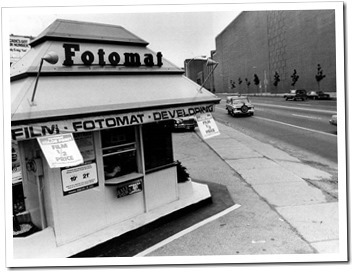 Customers would drive up to the Fotomat and drop off their film without leaving their vehicle. A courier picked up the film and brought it to a processing center. Fotomat had the pictures ready the next day, a terrific turnaround time in those days. Fotomat was ubiquitous and important to the Rochester area because it sold Eastman Kodak Co. film and used Kodak paper and chemicals for processing. Fotomat exploded onto the scene before disappearing almost as quickly due in large part to the uprising of one-hour photo processing plants. A California businessman named Preston Fleet started Fotomat in 1967 with about two dozen outlets in the San Diego area. Within a few years, the company had expanded to 1,000 outlets, including those in the Rochester area. The approach was fresh and original, and the Fotomat look — not far removed from that of Kodak’s signature “little yellow box” packaging — apparently required some explaining, as evidenced by a 1983 Democrat and Chronicle story. The story noted that the number had grown by then to 33 in the Rochester area and more than 3,800 nationwide and in Canada. The tiny Fotomat kiosks were staffed by a single employee — the females were “Fotomates” and the males “Fotomacs.” Curious customers often wondered how they could work in such cramped quarters. A woman from the Ridge-Seneca Fotomat in Rochester described how in the 1983 story. Fotomat participated in cooperative advertising with Kodak, but the companies’ relationship was not always gregarious. At least twice, Fotomat and Kodak battled in court over antitrust and trademark issues. 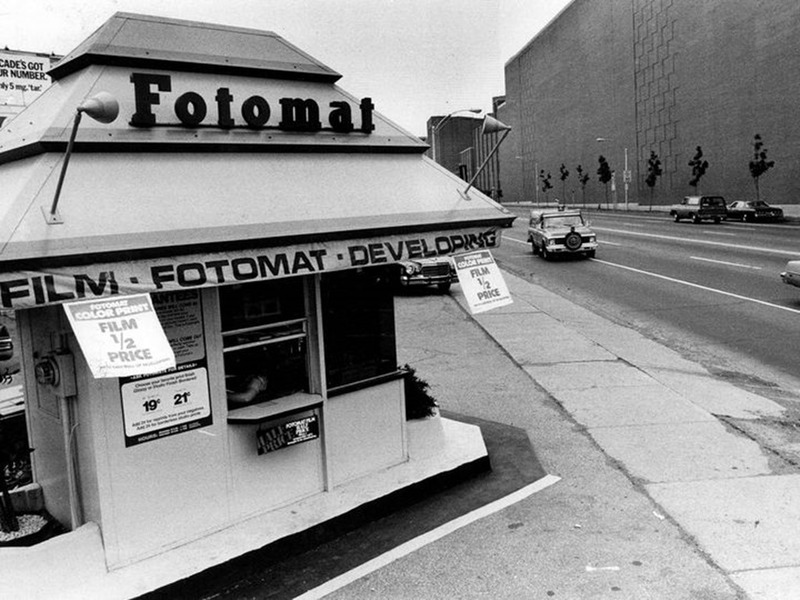 A 1970 lawsuit was settled with Fotomat agreeing to change the look of its kiosks. By the mid-1970s, Fotomat’s sales were declining and the company tried new strategies. Fotomat began a service of transferring home movies and slides to videotape, which was making huge inroads into homes. The company also started selling blank videotapes and then renting prerecorded tapes. Before long, one-hour film processing (offered locally by companies such as Carhart Photo, Wink Photo and One-Hour Instant Photo) hugely affected Fotomat’s business. So, too, did the rapid expansion of the 35-millimeter film market. Fotomat’s services were built around the old Instamatic-style Kodak camera films, which made up more than 90 percent of Fotomat’s business in the early 1970s. Within a decade, camera users were opting for the better quality 35 mm. Fotomat management made an effort to capture that market by the late 1970s, but the company’s struggles continued. “The biggest single factor was our own ineptitude,” company president Richard D. Irwin was quoted as saying in a 1981 New York Times article. Fotomat’s “torrid expansion” coincided with the increased availability of photofinishing services in supermarkets and pharmacies. New Fotomat kiosks were put up near existing ones, “cannibalizing sales,” as the Times article stated. Fotomat announced plans in 1983 to close 1,000 of its outlets in a cost-savings effort. By 1988, all of the Chicago and Milwaukee-area kiosks were closed. By 1990, the number of outlets in the U.S. and Canada dwindled to about 800, down from a peak of nearly 4,000. The switch from film to digital imaging was yet another development that devastated Fotomat and many other film-processing companies. It’s not immediately clear when Fotomat left the Rochester area, but it seems likely it was during that timeframe. Corporate ownership of Fotomat changed hands a few times; the company began specializing in an online digital software site that was discontinued in 2009. Many of the old Fotomat kiosks still remain throughout the country as repurposed businesses. Websites have posted photos of the old Fotomat huts now being used for ventures such as coffee-to-go, watch repair, locksmith services and cigarette stores.